Cody Petro did what he has consistently done all year, turning in two outstanding touchdown receptions and securing more than 200 all-purpose yards against Upperman Friday (Oct. 28). Unfortunately, for Cannon County, the Lions were also consistent in that the problems that have plagued the team all season were evident in a 48-16 setback against Upperman at Schwartz Field Friday. The Lions' offense (0-10, 0-5) committed four turnovers, leading to 28 Upperman points, and the defense failed to get off of the field on key third- and fourth-down conversion plays that either kept drives alive or led to touchdowns for the Bees (4-6, 2-3). Put it all together and the end result was another one-sided setback for the Lions. "I know we are capable of doing so much more than what we are," Cannon County Head Coach Joel Schrenk said. "For whatever reason it is not transferring to the field. Defensively, we were better at times but then when we needed a stop a big play would happen. We would blow a coverage or wouldn't make a check. Ultimately that is my fault for not having them ready. We do it all week in practice." Petro continued to do what he has all season too. The junior receiver was outstanding as he turned two passes from quarterback Ryan Jordan into touchdown grabs of 47 and 36 yards, respectively. He had 126 yards receiving and more than 75 yards on kickoff returns. "Cody had a great game and played very well," Schrenk said. "He's been one of the bright spots this season." Trailing 41-0 in the third quarter, Jordan and Petro connected on a 54-yard scoring play. Jordan's two-point conversion to Waylon Sedtal capped the drive. Petro and Jordan would hook up again in the fourth quarter, this time for a 36-yard scoring play. The two-point attempt failed. Jordan finished with more than 200 yards through the air as Justin Tobin also had another good night with more than 70 yards receiving. Despite the positives, Jordan also was guilty of three interceptions and fumbled once. "If we throw the ball to who we are supposed to then we are wide open," Schrenk said. "We are past being young and learning. It is just not executing. We gave them four extra tries and that's four less opportunities for us." 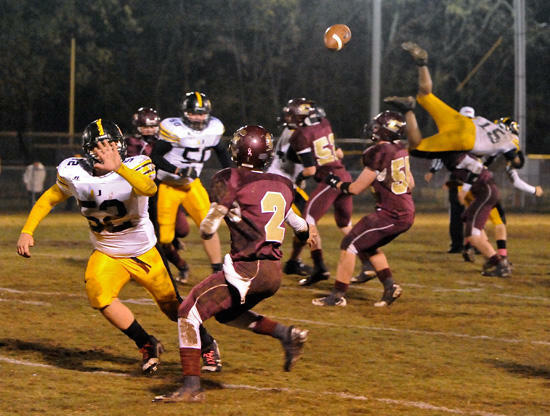 Upperman didn't need too much help. The Bees led 14-0 after one quarter and stretched the advantage to 34-0 by halftime. Cannon County's defense ended the regular season allowing 40 points or more in nine of the 10 games. They allowed 39 points in the other contest. Cannon County did score a safety when the Bees snapped the ball out of the end zone in the fourth quarter. B.J. Daniel and Sedtal also had fumble recoveries for the Lions, who have an 11-game home losing streak dating back to the 2009 home playoff loss. Some would say a sad end to a sad season. Personally I am proud of every young man on that field. Football is a tough sport and these players put a lot of time and effort in to doing what they do. All of them, not just the ones who get mentioned every week. So to the ones who shine I'm proud of you, to the ones who were there making it possible for you to shine I'm proud of you, and to the ones standing patiently on the sidelines just hoping to get to step out on the field I'm proud of you. No this wasn't a winning season, but win or lose, it took ALL of you working together and never giving up to play this game every week. So hold your heads up I'm proud of you and I know I'm not alone. I too am proud of the team and staff we all knew at the onset of the season it might be a long one but hold your heads up your hard work and determination will prevail in the future! Well said RedTailedRooster! These kids are WINNERS no matter the score. All of Cannon County is proud of you and all your hard work! Good luck next week at Wartburg. To the Seniors, thanks for the memories, and good luck. To the underclassmen, stick with it! CCHS football needs you. See you on the field in August. We STILL believe! Congrats to the boys to another season of hard work. I am proud of everyone of these guys. Can't wait for season to start next year. hopefully for everyones sake with a ENTIRE new staff! but to the boys hit the weight room hard this winter because games are truly won in the off season. I hope that ALL of these young men stay together and determine that they will "stay the course" and not quit when times are hard. Turn this thing around... We Believe!